First look at this one will think it is a milk shake. But not it is not. I wanted to make something special for valentine’s day. I love chocolates but not by my husband. So wanted to make something liked by both and not a typical cake or an Indian dessert. 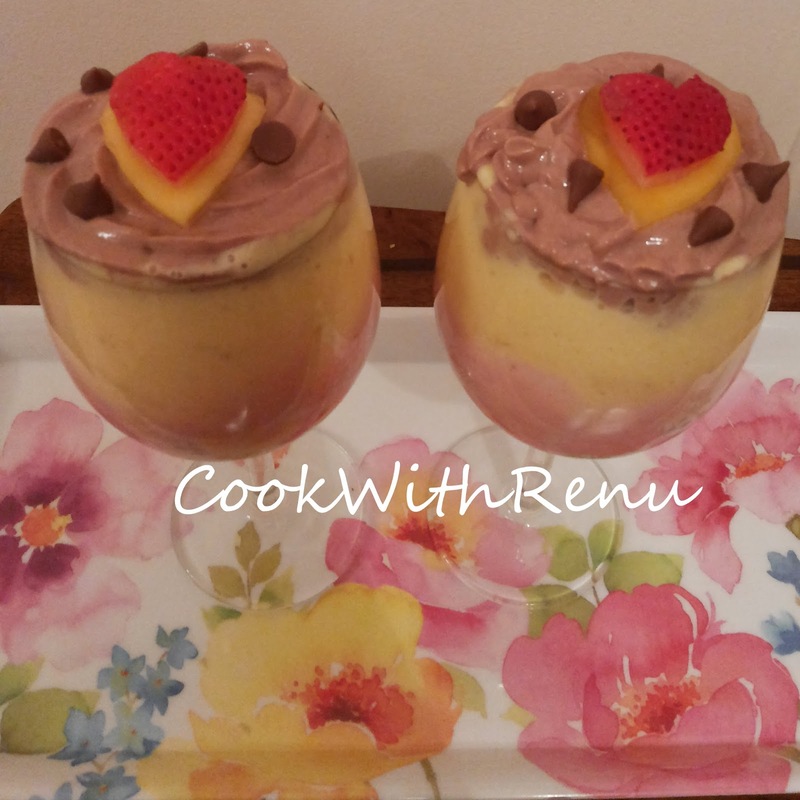 My hubby likes Shrikhand a lot and so do I. So thought of making this but not the usual way. I had greek yogurt at hand (One can use simple curd/yogurt by removing the water), and fruits like strawberry and Mango. 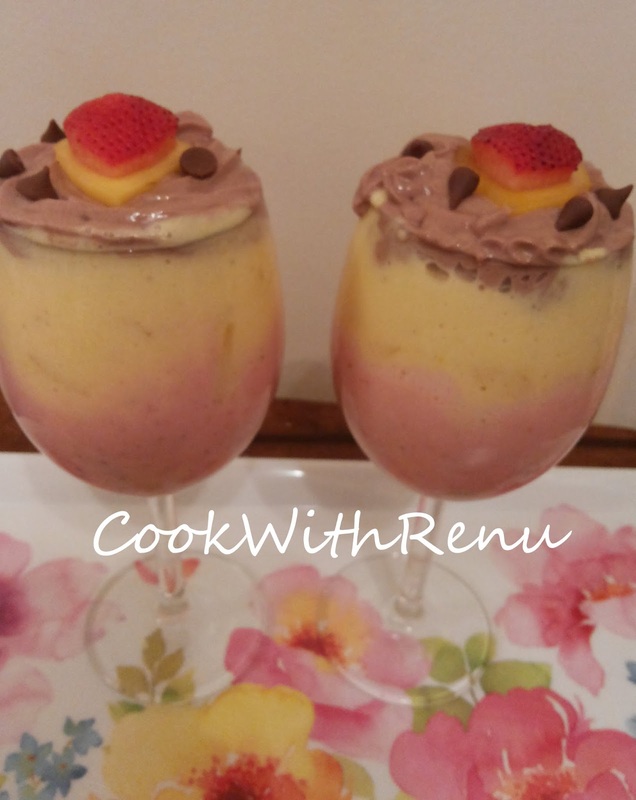 I started to make it like a shrikhand, but because of the puree of fruits it became a little watery. But I simply popped up it in the freezer and it was perfect. May be the thickness of the shrikhand would have not been liked that much. Also my mango was unfortunately not on the sweeter side so had to add more sugar. But a sweeter mango is always advisable. And the third ingredient is my favorite cocoa powder, for which I was doubtful in the start as was not sure how will the mix of cocoa and yogurt will go, as have never tasted it nor heard of it. But it added the kick to the Parfait. 1 tablespoon of Finely sliced mango. Some 7-8 choco cips for garnish. Divide the yogurt into three parts. Add part of yogurt in a blender along with strawberries and sugar. Blend it. I pureed it roughly as I wanted some strawberry pieces in between. If you do not want it puree finely. In the second part of yogurt add mango, sugar and a pinch of cardamon. Puree it and after wards add the finely sliced mango to it, so that you have the pieces in your each bite. In the third part blend the yogurt, cocoa and the sugar. Add the choco chips in the mixture but do not puree it. 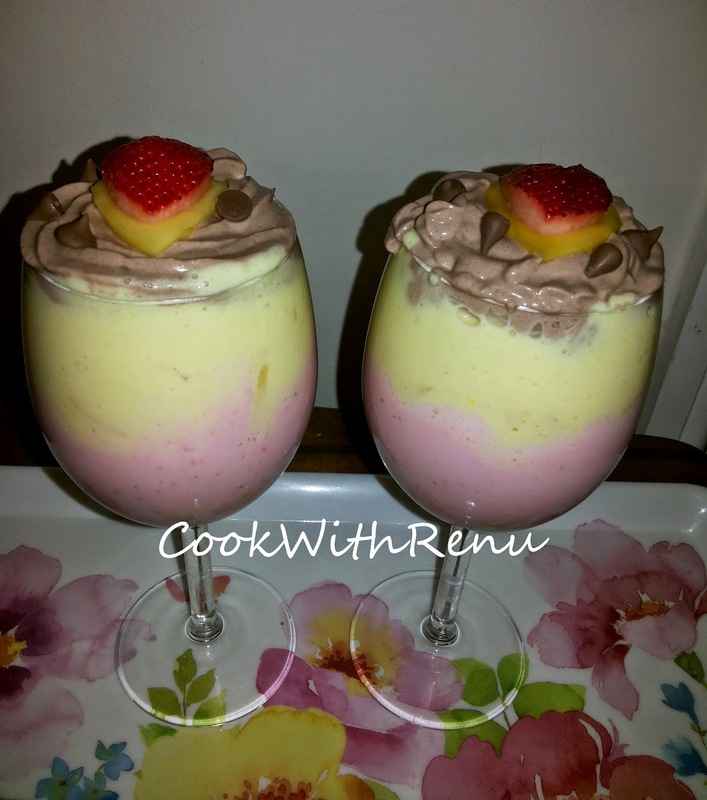 In a wine glass, or any glass of your choice, first add the strawberry yogurt mixture. If watery pop it in the freezer for atleast 15 minutes. Slowly with the help of a spoon add the mango yogurt puree, mixed along with the the mango slices. If require freeze it for 10-15 minutes. Next add the final layer of cocoa yogurt mixture, along with the choco chips. I added this with the help of piping bag but a spoon should work as well. For garnish I did cut heart shapes from mango and strawberry and drizzled some choco chips on it. The first glass I just chilled for 10-15 minutes and the second we enjoyed the next day. The chilled one was more better. So I would advise it to chill it for some hours in the refrigerator.